Comments: Jedi mind tricks often work on the weak-minded. Such is the case when a squad of sandtroopers asks Jedi Maser Obi-Wan Kenobi about the two droids that are with him in a landspeeder. Obi-Wan tricks them into concluding, "These aren't the droids we're looking for." 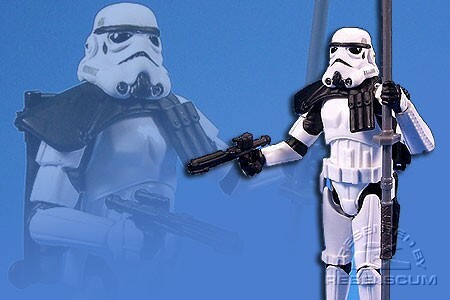 This Sandtrooper (Corporal) figure is a repack of 2007's SAGA LEGENDS Sandtrooper. While this Corporal version was made in the 2007 line, it was very quickly changed to a white-pauldron sergeant, therefore making it very rare. This figure was one of the Final Four of the Saga Legends Tournament held in the fall of 2006.